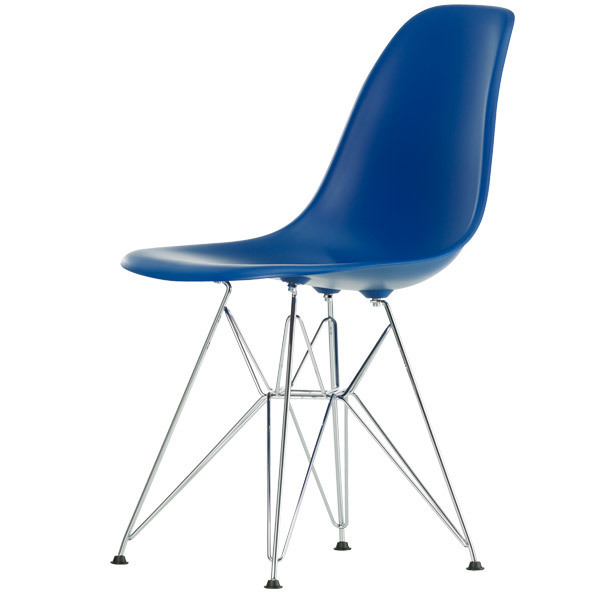 Vitra’s Eames DSR chair is also known as the Eiffel chair due to the graphical cross structure formed by its metal legs. The name DSR comes from the words Dining Height Side Chair Rod Base. 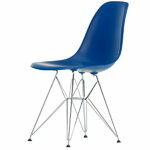 Designed by Charles and Ray Eames, the plastic Eames chairs are true design icons of the 1950s. Their popularity lies in the timeless, ergonomic design and various leg options. The original model with a fibreglass seat was the first industrially produced plastic chair. Today, the seat of the Eames chair is made of polypropylene. Vitra launched the updated versions of the Eames chairs at the Milan Furniture Fair of 2015. Because the average human height has increased by almost 10 centimetres in the past 60 years, Vitra considered necessary to update the size of the classic chairs. Depending on the model, the length of the legs has been increased by about 20 mm, and the geometry of the seat has been carefully readjusted. The changes seem minimal, but they make the Eames chairs significantly more comfortable for today’s needs.